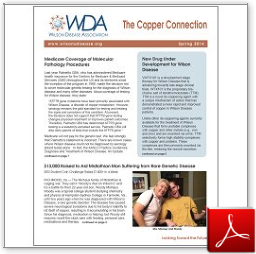 Wilson disease is a genetic disorder in which copper does not get excreted from the body. This excess copper builds up in the liver, brain, eyes, and other organs. If left untreated, Wilson disease can cause severe brain damage and neurological symptoms, liver failure, and death. What are the symptoms of Wilson disease? The presentation may occur from 3 to 55 years of age. It is suspected when a young patient presents with acute liver failure or cirrhosis. Wilson disease is a genetic disorder due to mutation of the ATP7B gene. More than 300 mutations have been identified. Wilson disease is an autosomal recessive trait, that means the affected individual must receive two copies of an abnormal gene one from each parent, both of whom are carriers of the disease. Not all tests may be positive in all patients, but a family history of a close relative having Wilson disease or symptoms suggestive of Wilson disease is extremely helpful to make a diagnosis. How is Wilson disease treated? The treatment includes removal of excess copper, reduction of copper intake and to treat any liver or central nervous system damage. D-penicillamine or trientine hydrochloride help remove copper from tissue. Patients will also need to follow a low-copper diet, which means avoiding shellfish, liver, mushrooms, nuts, chocolate and dried fruit. Liver transplantation is needed in patients with acute liver failure due to Wilson disease. Early detection and life long treatment can ensure patient maintains a completely normal health. How are patients monitored on treatment ? Who is at risk for Wilson Disease? All siblings and children and close family members of Wilson disease patients should be genetically tested for the condition. Though the exact frequency is not known, the disease is not uncommon. Marriage within families (consanguinity) still takes place in certain communities and should be strongly discouraged. 1. Ann Indian Acad Neurol. 2012 Jul;15(3):200-1. Ocular signs in Wilson disease. Acute on chronic liver disease in children from the developing world: recognition and prognosis. 4. Indian Pediatr. 2011 May;48(5):406-7. Reversal of severe Wilson arthropathy by liver transplantation. 5. J Pediatr Endocrinol Metab. 2011;24(3-4):185-6. Neurological Wilson's disease with refractory rickets. Kaur S, Maheshwari A, Aneja S, Patra S, Krishnamurthy S, Seth A. 6. Indian J Dermatol Venereol Leprol. 2011 Jan-Feb;77(1):55-8. Penicillamine-induced elastosis perforans serpiginosa with abnormal "lumpy-bumpy" elastic fibers in lesional and non-lesional skin. Khatu SS, Dhurat RS, Nayak CS, Pereira RR, Kagne RB. 7. Oral Surg Oral Med Oral Pathol Oral Radiol Endod. 2011 Jan;111(1):20-3. Dental considerations in the patient with Wilson's disease. Lohe VK, Kadu RP, Degwekar SS, Bhowate RR, Wanjari AK, Dangore SB. 8. Neurol India. 2010 Nov-Dec;58(6):933-8. Sleep in Wilson's disease: a polysomnography-based study. Netto AB, Sinha S, Taly AB, Panda S, Rao S.
Gabapentin as a rescue drug in D-penicillamine-induced status dystonicus in patients with Wilson disease. Paliwal VK, Gupta PK, Pradhan S.
10. Neurol India. 2010 Sep-Oct;58(5):708-13. Cognitive profile and structural findings in Wilson's disease: a neuropsychological and MRI-based study. Hegde S, Sinha S, Rao SL, Taly AB, Vasudev MK. 11. Neurol India. 2010 Jul-Aug;58(4):627-30. R778L, H1069Q, and I1102T mutation study in neurologic Wilson disease. Kalita J, Somarajan BI, Misra UK, Mittal B. 12. Parkinsonism Relat Disord. 2010 Dec;16(10):639-44. Epub 2010 Aug 14. 13. Mov Disord. 2010 Apr 30;25(6):672-8. Do MRI features distinguish Wilson'sdisease from other early onset extrapyramidal disorders? An analysis of 100 cases. Prashanth LK, Sinha S, Taly AB, Vasudev MK. 14. Trop Gastroenterol. 2009 Jul-Sep;30(3):163-6. Clinical profile, prognostic indicators and outcome of Wilson's disease in children: a hospital based study. Tryambak S, Sumanta L, Radheshyam P, Sutapa G.
15. Neuroradiology. 2010 Nov;52(11):977-85. Epub 2010 Feb 20. Wilson's disease: (31)P and (1)H MR spectroscopy and clinical correlation. Sinha S, Taly AB, Ravishankar S, Prashanth LK, Vasudev MK. 16. J Neurol Sci. 2010 Apr 15;291(1-2):44-51. Epub 2010 Feb 8. Spectrum of epilepsy in Wilson'sdisease with electroencephalographic, MR imaging and pathological correlates. Prashanth LK, Sinha S, Taly AB, A Mahadevan, Vasudev MK, Shankar SK. 17. Neurol India. 2009 Sep-Oct;57(5):528-40. Wilson's disease: An Indian perspective. Taly AB, Prashanth LK, Sinha S.
18. Auton Neurosci. 2009 Dec 3;151(2):154-8. Epub 2009 Aug 8. Cardiovascular and sudomotor autonomic dysfunction in Wilson's disease--limited correlation with clinical severity. Soni D, Shukla G, Singh S, Goyal V, Behari M.
19. Neurology. 2009 Mar 17;72(11):e50. Teaching NeuroImages: face of the giant panda and her cub: MRI correlates of Wilson disease. 20. Clin Pediatr (Phila). 2009 Jun;48(5):555-7. Epub 2009 Feb 25. Recurrent limb weakness in a 17-year-old boy. Thapa R, Biswas B, Mallick D.
21. Pediatr Res. 2006 Apr;59(4 Pt 1):593-7. Erythrocyte metabolism and antioxidant status of patients with Wilson disease with hemolytic anemia. Attri S, Sharma N, Jahagirdar S, Thapa BR, Prasad R.
22. Hum Genet. 2005 Dec;118(3-4):541. Gene symbol: ATP7B. Disease: Wilson's disease. 23. Indian J Pediatr. 2006 Jan;73(1):99-100. Wilson'sdisease presenting as respiratory failure. Narayanan P, Chetan G, Mahadevan S.
24. Hum Genet. 2005 Jul;117(2-3):299. Gene symbol: ATP7B. Disease: Wilson disease. 25. Hum Genet. 2005 Jul;117(2-3):296. 27. Hum Genet. 2005 Oct;118(1):49-57. Epub 2005 Oct 28. Molecular pathogenesis of Wilson disease: haplotype analysis, detection of prevalent mutations and genotype-phenotype correlation in Indian patients. Gupta A, Aikath D, Neogi R, Datta S, Basu K, Maity B, Trivedi R, Ray J, Das SK, Gangopadhyay PK, Ray K.
28. QJM. 2005 Aug;98(8):557-63. Epub 2005 Jul 8. Prognostic factors in patients presenting with severe neurological forms of Wilson's disease. Prashanth LK, Taly AB, Sinha S, Ravishankar S, Arunodaya GR, Vasudev MK, Swamy HS. 29. Clin Genet. 2005 May;67(5):443-5. Identification and molecular characterization of 18 novel mutations in the ATP7B gene from Indian Wilson disease patients: genotype. Kumar S, Thapa BR, Kaur G, Prasad R.
30. J Neurol Sci. 2005 Feb 15;228(2):121-3. Epub 2004 Dec 8. Is low serum tocopherol in Wilson's disease a significant symptom? Sinha S, Christopher R, Arunodaya GR, Prashanth LK, Gopinath G, Swamy HS, Taly AB. 31. J Assoc Physicians India. 2004 Mar;52:246-8. Arthropathic presentation of Wilson's disease. Misra AK, Biswas A, Ganguly G, Ghosh A, Das SK, Roy T.
32. Clin Neuropathol. 2004 Sep-Oct;23(5):241-4. Co-occurrence of Wilson's disease and glioblastoma multiforme--is it a chance association? Sinha S, Prashanth LK, Mahadevan A, Satish S, Ravishankar S, Arunodaya GR, Taly AB, Shankar SK. 33. Indian J Pediatr. 2004 Oct;71(10):937-8. Ghosh JB, Chakrabarty S, Singh AK, Gupta D.
34. Int Urol Nephrol. 2004;36(2):289-91. Rare presentation of Wilson's disease: a case report. Kalra V, Mahajan S, Kesarwani PK. 35. Neurology. 2004 Sep 14;63(5):935-6. Effect of D-penicillamine on neuromuscular junction in patients with Wilson disease. Komal Kumar RN, Patil SA, Taly AB, Nirmala M, Sinha S, Arunodaya GR. 36. Indian Pediatr. 2004 Jul;41(7):744. 37. Hum Genet. 2004 May;114(6):606. Eapen CE, Santhosh S, Shaji RV, Chandy M, Chandy GM. 38. J Neurol Neurosurg Psychiatry. 2004 Jun;75(6):907-9. Wilson's disease: diagnostic errors and clinical implications. Prashanth LK, Taly AB, Sinha S, Arunodaya GR, Swamy HS. 39. Indian J Med Res. 2003 Nov;118:208-14. DNA linkage based diagnosis of Wilson disease in asymptomatic siblings. Gupta A, Neogi R, Mukherjea M, Mukhopadhyay A, Roychoudhury S, Senapati A, Gangopadhyay PK, Ray K.
40. J Neurol Sci. 2004 Jan 15;217(1):37-40. Successful pregnancies and abortions in symptomatic and asymptomatic Wilson's disease. Sinha S, Taly AB, Prashanth LK, Arunodaya GR, Swamy HS. 41. Int J Neurosci. 2003 Aug;113(8):1105-25. Hypothalamic digoxin and hemispheric chemical dominance: relation to alcoholic addiction, alcoholic cirrhosis, and acquired hepatocerebral degeneration.